Print this free cupcake applique pattern! Applique is a great way to add a fun embellishment to any sewing project. Whether you're a beginning seamstress or an expert with a needle, there are lots of lovely free applique patterns that are challenging and fun to create. If you need help downloading any of the patterns, check out these helpful tips. 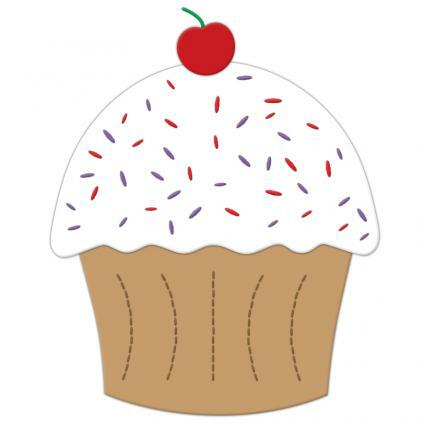 Click on the image and download the free cupcake applique. Size it according to your needs, and print it out. Cut out the pattern and pin it to your selected fabric. Felt works well, since it has stiff body and doesn't fray. You can also apply an iron-on backing to stabilize a cotton fabric or other material. Cut out the pieces of fabric for the applique. Use a darker shade of embroidery floss to add texture lines to the cupcake wrapper. Then sew the wrapper to your project. Embroider the frosting with sprinkles in your desired colors. Sew the frosting to the wrapper, allowing the bottom of the frosting to slightly overlap the wrapper. Applique the cherry on top of the frosting, and add a cherry stem with embroidery floss. Print this free bird applique pattern! 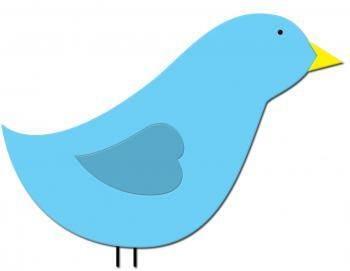 Click on the image of the bird applique to download the file. Adjust the size to fit your project, and print out the pattern. Cut out the pieces and pin them to the fabric you've chosen. This pattern works well with felt, but it's also fun with calico or other cotton fabrics. If you use a lighter bodied fabric prone to unraveling, be sure to stabilize it first with an iron-on backing. Cut out the fabric pieces, using the pattern as a guide. Applique the bird's wing in place first, before attaching the bird to your project. Use embroidery floss to add an eye for the bird. A French knot is a nice choice, since it adds dimension. Applique the bird onto your project. Embroider the bird's beak and legs. 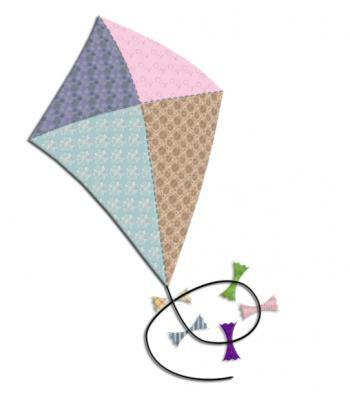 Print this patchwork kite applique pattern! This sweet applique pattern is perfect for a quilt block, tote bag, or wall art. Instead of using iron-on backing or felt, you'll be doing traditional applique and folding the raw edges under as you go. This project is a bit more involved, but it's not too complicated for a beginning seamstress. Click on the pattern image and download it to your computer. Adjust the size to fit your needs, and then print out the pattern. Cut out the pieces of the pattern and pin them to the fabrics you've chosen. Cotton calico is a good fabric choice since it's easy to work with and looks great. Cut out the fabric pieces and set aside. Take the two top pieces of the kite and place the right sides together. Pin the vertical seam. Using small stitches, sew the seam securely with an eighth-inch seam allowance. You can also use a sewing machine for this part. Take the two bottom pieces of the kite and place the right sides together. Pin this vertical seam as well. Sew the seam with an eighth-inch allowance. Use the iron to press both seams open. Pin the top portion of the kite to the bottom portion of the kite, right sides together. Sew the seam with an eighth-inch allowance. Press the last seam open using the iron. Fold over an eighth of an inch of fabric all the way around the outside of the kite, pressing the fold with the iron. Place your base fabric or project in an appropriately sized embroidery hoop and pin the kite in place. Applique the kite to the base fabric. Embroider a long, looping string for the kite, using the black embroidery floss. Use the pinking shears to trim the ends of five pieces of ribbon. For each piece of ribbon, take a few hand stitches in the middle and pull to gather the ribbon into a bow shape. Sew the bows at even intervals on the kite string. Looking for more designs? These other applique patterns will come in handy, depending on the type of project you're doing. Whether you're making a gift for a little girl or want to embellish a pillow for your living room, butterflies are a fun choice. These butterfly applique patterns are perfect for adding a little summer style to everything from bedding to clothing. Applique is a pretty way to embellish a sweatshirt to give as a gift or keep for yourself. These simple sweatshirt applique patterns can help your upgrade your look in no time. Applique doesn't always have to involve adding a fabric embellishment to another piece of fabric. You can also try reverse applique, which involves cutting out a pattern and letting the bottom fabric show through the design. Free Applique has many patterns for decorating denim shirts and T-shirts. The patterns are country-cute and include instructions for how and where to place the pattern pieces on your clothing. Patch Pieces has some great seasonal appliques you can use for gifts or holiday decorating. There's a lovely appliqued Christmas card here, as well as some flowers and a fall wreath. Wee Folk Art offers dozens of free applique patterns for felt or stiffened fabrics. You'll find animal designs, food, flowers, and other fun motifs. Planet Applique offers lots of free designs for machine applique and embroidery. If your sewing machine is capable of embroidery or applique, you might enjoy one of these patterns. There are dozens of beautiful free applique patterns online that will complement any fabric. No matter which pattern you choose, you'll be adding creative style and color to your project.